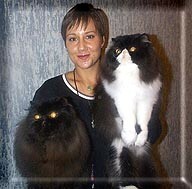 Kissables Persians., located in South Eastern Washington State, began as a love for Persians - my first contact was with my aunt's Himalayans and from that moment on I was smitten. I bought my first Persian when I was 12 years old and attended my first cat show at 13 in Hawaii. I started breeding at a young age, under a different cattery name, and though I did have some nice kittens in those days, I pet them out because I did not have the time, or support from friends and family, for showing. I believe if you are going to breed, then you need to be showing also. I bred off and on for the next few years until 1996, when I became a stay at home mom and realized I now had the time to give my hobby all it deserved. That was when I decided to focus on bicolors exclusively and the cattery name, "Kissables," was born. I purchased Ch Tehy Chesshire Grin of Kissables, aka "Chess," a red and white male. He quickly became the core of my current breeding program and he can be found in many of my pedigrees today. I also have to mention GC Cattabury Armanti of Marual, who is my "other side" of the foundation and his look and type have been a tremendous play in the "Kissables look." A very special thank you to Dena Gustaf for sharing this fine and loving male with me for a breeding season. His impact I still see today, generations away. After I purchased Chess, I became more active in showing and breeding and have made some very good friends. I owe so much to so many of my breeder friends for their constant support and friendship - and a most very special thank you to my mother, Priscilla Yamada, who has been so supportive of the cats and takes care of my boys when I am away at shows. Without the help and support of these exceptional people I would not be in cats today. They are all very special to me, each in different ways, and have added so much richness and friendship to my life and I love and cherish them all. (pictured on right with his litter brother on left, GP Kissables Wrangler of Chubbies) has produced beyond my wildest dreams and is an exceptional cat that I am proud to have my name on. At the time of this writing, he has sired 14 grand champions I enjoy showing and granding cats, and strive to produce consistent grand champion or better quality in my kittens, including DM's.